The fight between the two biggest global economies has disrupted trade in goods from soybeans medical equipment, battering exporters on both sides and rattling financial markets. 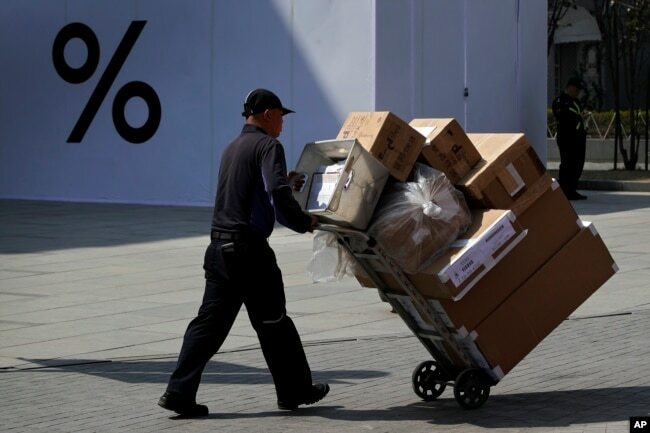 China’s economic growth held steady in the latest quarter despite a tariff war with Washington, in a reassuring sign that Beijing’s efforts to reverse a slowdown might be gaining traction. The world’s second-largest economy expanded by 6.4% over a year earlier in the three months ending in March, the government reported Wednesday. That matched the previous quarter for the weakest growth since 2009. “This confirms that China’s economic growth is bottoming out and this momentum is likely to continue,” said Tai Hui of JP Morgan Asset Management in a report. Communist leaders stepped up government spending last year and told banks to lend more after economic activity weakened, raising the risk of politically dangerous job losses. Beijing’s decision to ease credit controls aimed at reining in rising debt “is starting to yield results,” Hui said. Consumer spending, factory activity and investment all accelerated in March from the month before, the National Bureau of Statistics reported. The economy showed “growing positive factors,” a bureau statement said. Forecasters expect Chinese growth to bottom out and start to recover later this year. They expected a recovery last year but pushed back that time line after President Donald Trump hiked tariffs on Chinese imports over complaints about Beijing’s technology ambitions. The two governments say settlement talks are making progress, but penalties on billions of dollars of each other’s goods are still in place. China’s top economic official, Premier Li Keqiang, announced an annual official growth target of 6% to 6.5% in March, down from last year’s 6.6% rate. Li warned of “rising difficulties” in the global economy and said the ruling Communist Party plans to step up deficit spending this year to shore up growth. Beijing’s stimulus measures have temporarily set back official plans to reduce reliance on debt and investment to support growth. Also in March, exports rebounded from a contraction the previous month, rising 14.2% over a year earlier. Still, exports are up only 1.4% so far this year, while imports shrank 4.8% in a sign of weak Chinese domestic demand. Auto sales fell 6.9% in March from a year ago, declining for a ninth month. But that was an improvement over the 17.5% contraction in January and February. Economists warn that even if Washington and Beijing announce a trade settlement in the next few weeks or months, it is unlikely to resolve all the irritants that have bedeviled relations for decades. The two governments agreed Dec. 1 to postpone further penalties while they negotiate, but punitive charges already imposed on billions of dollars of goods stayed in place. Even if they make peace, the experience of other countries suggests it can take four to five years for punitive duties to “dissipate fully,” said Jamie Thompson of Capital Economics in a report last week. Chinese leaders warned previously any economic recovery will be “L-shaped,” meaning once the downturn bottomed out, growth would stay low. Credit growth accelerated in March, suggesting companies are stepping up investment and production.